general rules, the Corruption ability score, new skills, a hit selection system, races, character backgrounds, the psyker feat. What’s in the third post? BONUS Owen K.C. Stephens’ has a great post to grab some meat out of when setting up your Warhammer 40k D&D 5E games: Ultimate Deathwatch. Though it remains rare among humanity there are genetic anomalies that allow certain individuals to tap into the Warp, using its energies to enact wondrous powers and lethal abilities that defy the laws of nature. 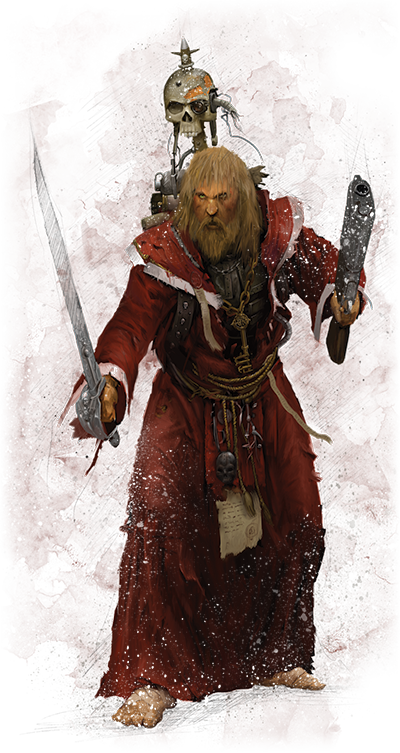 Using only their mind and will, psykers learn to harness their innate talents to strike down their enemies and otherwise do the impossible. Beginning when you choose this archetype at 1st level, you gain the ability to manipulate the very aether of the Warp. While casting a cantrip or spell from the sorcerer spell list, you must make a concentration check (DC 8 for cantrips or DC 8 + spell level). On a failure, you gain 1 point of Corruption, and on a failure with a natural roll of 1 you do not cast the spell and roll on the Wild Magic table. On a natural 20 or result equal to 20 + spell level, the spell functions as if it were cast as a level higher (or for cantrips, as if you had 5 more caster levels). Also at 1st level, you gain telepathy to a range of 10 feet per point of proficiency bonus you possess. You can communicate telepathically with any creature that is within range and able to see you. You don’t need to share a language with the creature for it to understand your telepathic utterances, but the creature must be able to understand at least one language. At 6th level, your studies of the Warp and your abilities have borne fruit. You add a number of cantrips and spells to your list of spells known equal to your Charisma modifier. You may only learn one new cantrip and one new spell per level of spell you can cast (for example, if your Charisma score is 18 you can learn one cantrip, one 1st-level spell, one 2nd-level spell, and one 3rd-level spell). Starting at 14th level, you can spend 1 day meditating to create a psyfocus. While on your person, your psionic focus is able to concentrate on a spell for both you and it, granting it to each of you. When it is on your person but you are not using your psyfocus in this way, you have advantage on concentration checks. At 14th level, you learn more cantrips and spells (as the 6th level feature). Beginning at 18th level, you can cast astral projection at will with a casting time of 1 minute, though you can only target yourself. In addition, while projecting you can possess a creature wearing a wraithbone locket (which takes you 1 year of effort to create) that you are attuned to. An unwilling creature receives a Wisdom saving throw to resist this feature. When you leave the creature’s body, you each gain 1 level of exhaustion for each minute you possessed the body. A successful Constitution saving throw halves these levels of exhaustion (minimum 1). 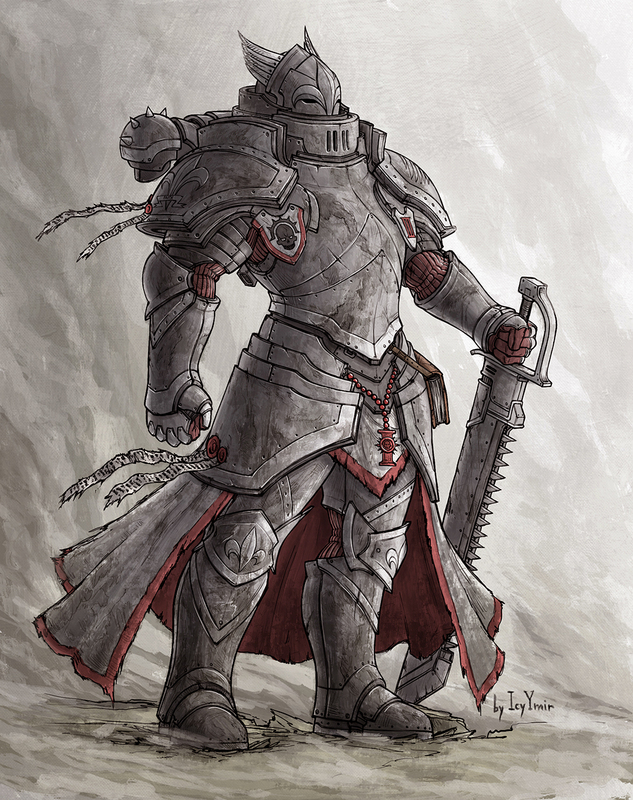 The Grey Knights are a secret, mysterious Loyalist Chapter of Space Marines specifically tasked with combating the dangerous daemonic entities of the Warp and all those who wield the corrupt power of the Chaos Gods. They have the honor of being implanted with gene-seed engineered directly from the genome of the Emperor Himself. The existence of the Chapter is virtually unknown outside of the Inquisition and the highest echelons of the Imperial Adepta, and is a well-guarded secret enforced by mind-wipes and even assassination of Imperial citizens if necessary. Unlike other Astartes, every Grey Knight is a potent psyker. Yet, in the 10,000 standard years of Imperial history, no Grey Knight has ever been corrupted by the Ruinous Powers of Chaos. Note: When you choose this archetype, you get the Pact of the Blade. Your pact weapon is either a greatsword or a maul. Grey Knights do not gain expanded spells. Instead at 1st level, 3rd level, and every odd warlock level thereafter, you gain 1 psipoint (up to a maximum of 10 psipoints at 19th level). Whenever you encounter an active spell that has been cast within the last week, you may expend 1 psipoint as an action to negate the spell. When you witness a creature within 50 feet casting a spell, you may expend 1 psipoint as a reaction to negate the spell. A spell you negate must be of a level no higher than what’s shown in the Warlock table’s Slot Level column for your level. When you attempt to negate a spell higher than your Slot Level, it is not negated but you gain advantage on saving throws to resist it or the caster is at disadvantage on its attack roll. When you finish a long rest, you regain all expended psipoints. Starting at 1st level, you have a number of temporary hit points equal to your Charisma modifier. When these hit points are depleted, they replenish after 1 minute or immediately upon spending an action focusing your mind. Beginning at 6th level, you gain resistance to psychic damage and immunity to the charmed condition. When a creature targets you with a spell that causes the charmed condition, it makes a Charisma saving throw against your spell save DC or becomes confused (as the spell) for 1 round. At 10th level, creatures that are within your reach provoke an opportunity attack from you when they cast a spell. In addition, enemies within your reach are at disadvantage on concentration checks made to maintain a spell and any weapon you wield counts as a magical weapon. Starting at 14th level, when you hit a creature with an attack, you can use this feature to cut off a creature’s access to magic. For a number of rounds equal to half your proficiency bonus, the creature is targeted by an effect that functions as the antimagic field spell except that its range is reduced to touch and it has no radius (affecting only the creature). On its turn, a creature targeted by this feature can spend its action to make a Charisma saving throw against your spell save DC to end the effect. Once you use this feature, you can’t use it again until you finish a long rest. The Orders Militant of the Adepta Sororitas are the best-known part of the organization, feared by the enemies of the Imperium as the stalwart and unyielding Sisters of Battle, the army of the Ecclesiarchy. Clad in ceramite power armor, they carry an awesome array of weaponry with which to vanquish their enemies, the Sisters of Battle are trained to the peak of human ability and stand amongst Mankind’s most dedicated and disciplined warriors. Wherever there are foes of the Emperor, the Sisters of Battle can be found fighting with faith and steel. When not actively prosecuting the Ecclesiarchy’s wars, the Battle Sisters of the Orders Militant divide their time between rigorous training and devout worship of the Emperor. These disciplines are nigh inseparable for while combat drills and studies of battle tactics can hone the body and the mind, only penitent prayer can bolster the spirit and all three are required to defeat the Imperium’s foes. The combination of combat doctrine and prayer is most evident on the battlefield, where Battle Sisters loudly proclaim their faith in hymn and verse as they march to war, calling upon the Emperor to aid them in the fight against their enemies. Faithful Smite. You can spend 1 faith point to deal an additional 1d6 radiant damage with your melee or ranged attacks until the start of your next turn. When you reach 5th level in this class the additional damage increases to 1d8, at 10th level it increases to 1d10, and at 15th level it increases to 1d12. Patient Defense. You can spend 1 faith point to take the Dodge action as a bonus action on your turn. Step of the Wind. You can spend 1 faith point to take the Disengage or Dash action as a bonus action on your turn, and your jump distance is doubled for the turn. When you reach 3rd level, you are able to deal your unarmed strike damage when making ranged weapon attacks and you gain proficiency with improvised weapons. When you reach 14th level, you may spend a bonus action to make an additional ranged attack (as though you were using the Martial Arts feature) after making a ranged attack or melee attack. Any feature that grants a benefit to your unarmed strikes applies to any weapon you wield. Beginning at 6th level, when you deal fire damage, you deal an extra 1d6 fire damage. your AC becomes 14 + Dexterity modifier (maximum 2) + Wisdom modifier. you gain darkvision 120 feet. your Strength score increases by 2 (this does not modify your maximum Strength score). you are able to jump as far as 30 feet horizontally or 20 feet vertically without the need for a check (these distances are added to the distances that result from any jump checks). you reduce all falling damage by 30.
your unarmed strike damage changes to 1d6. melee weapons mounted onto your power armor cannot be disarmed. as long as you are wearing your power armor’s helmet, while the suit is intact it grants immunity to all gas-based attacks and effects, possessing an internal air tank you can breathe from for up to 4 hours. you are able to walk on metal surfaces in the void of space or zero gravity environments. you ignore the first 3 points of damage whenever you take non-psychic damage. At 17th level, when an attacker that you can see hits you with an attack, you can use your reaction to halve the attack’s damage against you. Side note regarding the Sister of Battle: The 6th level feature is useless. Monks already gain an extra attack at level 5. Indeed it is. Replaced with BURN THE HERETIC!